Deluxe Silicone Cooking Utensils 23-Piece Set Just $38.88! Down From $140! PLUS FREE Shipping! You are here: Home / Great Deals / Amazon Deals / Deluxe Silicone Cooking Utensils 23-Piece Set Just $38.88! Down From $140! PLUS FREE Shipping! This is great for personal use for a Christmas present! Amazon is now offering this Deluxe Silicone Cooking Utensils 23-Piece Set for just $38.88 down from $139.99 PLUS FREE shipping! A must have for every kitchen, the Zestkit 23pc. Deluxe Kitchen Tool Set has every tool for the essential kitchen. These utensils will get you through every step in the cooking process from peeling fruits and vegetables to flipping burgers and even putting together the ingredients for the perfect cake batter. The silicone grips in the utensils also provide a better grip when working with foods in the kitchen. With heat resistant and silicone heads, it will never scratch your any experience pans or pots. They are all FDA approved, BPA free and dishwasher safe, giving you peace of mind and an easier kitchen cleanup. 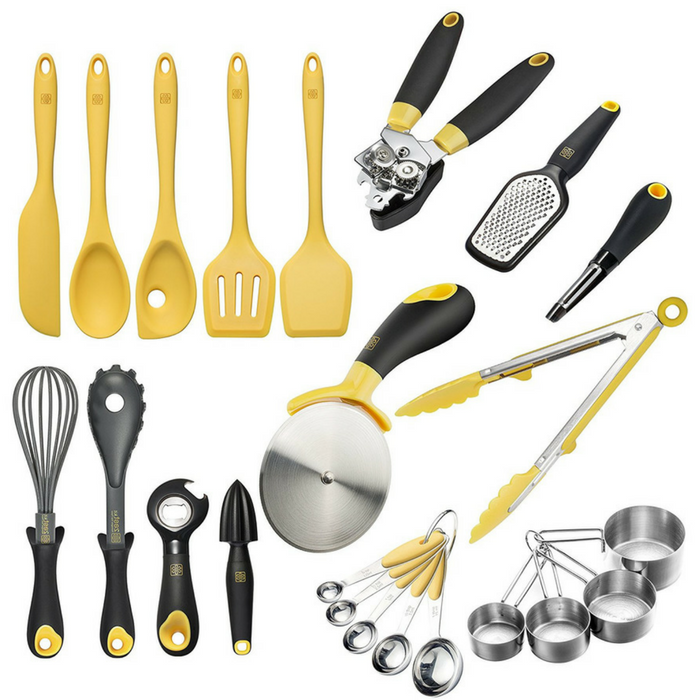 Less Money, Multi Tools: The essential kitchen utensils set includes can opener, peeler, lemon press, pizza slicer, measuring cups and spoons, food tongs, spoon, spatula, turner, slotted turn, whisk, and pasta server etc. Each utensil has a hanger hole in its handle, which helps to storage safely and easily. Must Have for Every Kitchen: These durable utensils that are comprised of heat-resistant materials such as high quality stainless steel, silicone, and nylon. Non-stick surfaces will never scratch any expensive cookware, cooking becomes safe and happy. Safe in Mind: Never melt in cooking to keep healthy and delicious meals, FDA approved and BPA free. Easy to Clean: Simply rinse them in the running water or just put them in the dishwasher for convenience.